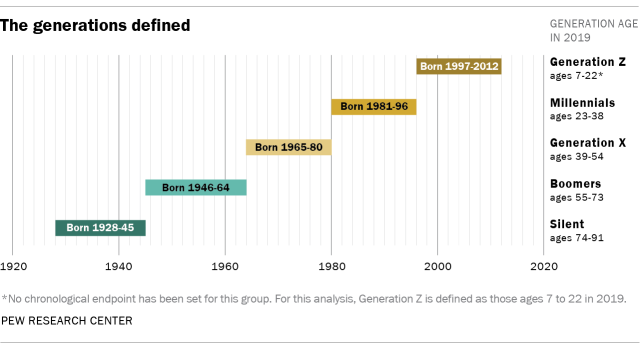 Anyone born between 1981 and 1996 (aged 23 to 38 in 2019) is considered Millennial, and anyone born since 1997 is part of a new generation called Generation Z or Gen Z. Most Millennials were between 5 and 20 years old when the September 11 terrorist attacks shook the United States, and many were old enough to understand the historical significance of that moment, they also grew up in the shadow of the wars in Iraq and Afghanistan, and just 15M, which sharpened a broader view of parties and politics today. During the Obama era, the Millennials had the greatest confidence in government among all generations; today, they are the least. Alexandria Ocasio-Cortez and her new colleagues in the U.S. legislature could help reverse that trend with a vengeance. This year's students are 10 years younger on average than serving members of the U.S. Congress. Twenty newcomers, including 14 Democrats, are millennials, more than three times the representation of the generation in the legislative group. Alexandria Ocasio-Cortez's Instagram Stories feel in the air like a harbinger of a possible new political future, taking full advantage of the direct access offered by social networks. With the little time she's been in Congress, she's already reached the kind of "normal person" personality that most politicians never get to achieve. The Ocasio-Cortez Instagram Stories allow younger voters to see in real time how a legislator their age discovers the idiosyncrasy of Congress. The new congresswoman presents herself as a novice with wide open eyes but skeptical, dreamy and enthusiastic about free snacks in the new members' room, as she shows us in her stories; then she joins a protest of activists in front of Nancy Pelosi's office, and later compares the ornate architecture of the Capitol with a dinner at Hogwarts, a fact that all Millennial and Gen Z know very well. For Ocasio-Cortez, whose brand and appeal are wrapped in her identity as a young populist who has more in common with her fellow former waiters colleagues than with her current congressional colleagues, being honest via social networks about her ignorance and insecurities is making her even more authentic. Just as in past decades there have been revolutions that united, protested and created their own art, fashion, music and literature with the intention of overcoming their old-fashioned predecessors. So it is now with Generation Z and the Millennials, they imagine, work and surf the net in search of a better world. One thing is clear, they have begun a new era. In an age of global socio-political movements, Gen Z and Millennials are using digital media to accelerate activism and social change. 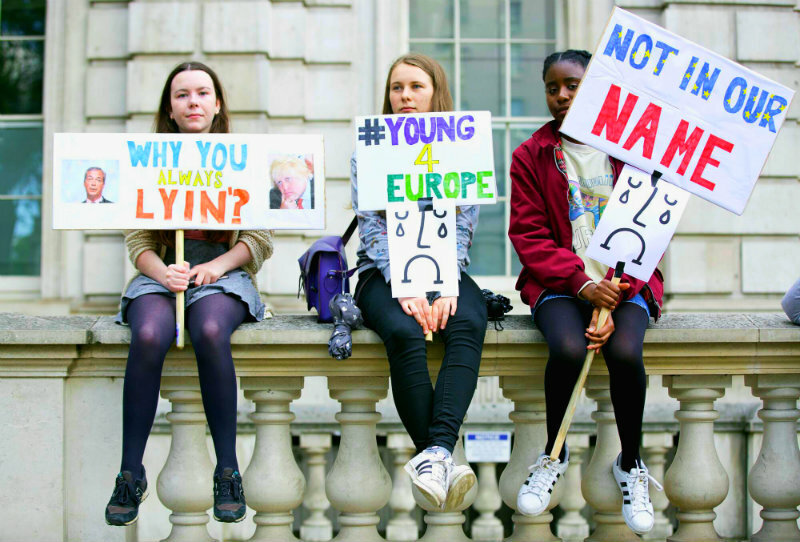 With 60% of Generation Z and 39% of Millennials eager to have their impact on the world, the act of wearing politics as a badge is what is being worn now. Activists of these two generations are tech-savvy and use social channels such as Twitter, Instagram and Facebook to further increase attention to their causes. Most importantly, social networks allow faster response times for protests, rallies and organized marches. Whereas 10 years ago it took weeks to organize protests, Millennial and Gen Z can come together with the simple help of a smartphone, earning the nickname of clicktivists. Technology, particularly the rapid evolution of the way these generations communicate and interact, is another consideration that shapes a generation. Millennials came of age during the Internet explosion. iPhone was launched in 2007, when the oldest Z Gen was 10 years old. By the time they were teenagers, the primary means of connecting to the Internet was through mobile devices, WiFi, and fiber. Social networks, constant connectivity and paid entertainment are the everyday life of these generations and this changes their vision of what they consider real or not. These generations have forced all marketing methods used by politicians to change, as this demographic group is the one that spends the most time online. Politicians have had to analyze new strategies to reach and impact this population group that has ideas very different from traditional and are more difficult to influence political parties with their traditional methods. The strategies that must be implemented to unite the Millennials generation, and politics, must be oriented to the digital world, politicians must adapt the message so that it can arrive in the correct way since it is not the same to communicate through an Instagram stories than through Twitter. However, it is necessary for politicians to use all social networks if they want to get the message across to this entire population segment, even if not everyone communicates the same. Millennials especially want to devote their time to something they know they can change. They have been called the "sharing generation" and their nativity with social networks could reform politics, showing voters a different side of campaigning and lawmaking. And this is only the beginning of the new generations in positions of power, what else will the next few years hold?